In need of an exceptional Oklahoma TV Repair Service? Call us today for more information! 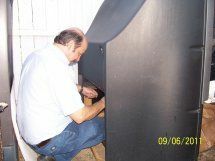 At Cassel Mobile TV Service, we provide fantastic television repair services throughout the state of Oklahoma. Our team of professionals will ensure that all your needs are met and exceeded. Call us today to discuss all your television repair servicing needs. Call the experts at Cassel Mobile TV Service when your TV is in need of some TLC. Instead of disconnecting your TV, loading it up in your vehicle, and driving it to a service center, let our dedicated team of TV repair experts come to your home. We'll diagnose and service your television, and save you valuable time and money in the process. At Cassel Mobile TV Service, we will come to you for all your in home TV repair service needs. We are an authorized Mitsubishi and Hitachi television service and repair center.